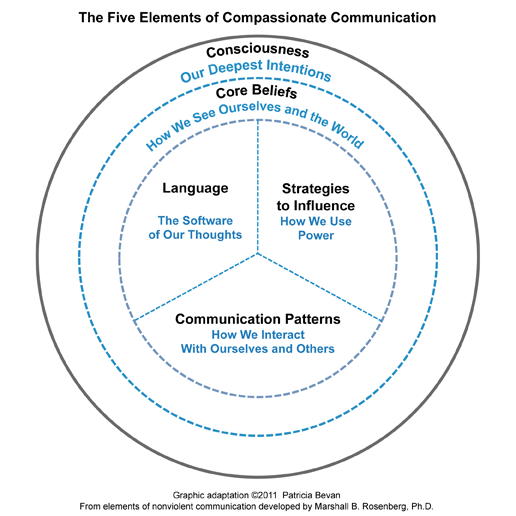 The integrated elements of Nonviolent Communication developed by Marshall B. Rosenberg, Ph.D. provide a framework for understanding how connecting with compassion can touch and transform our life experiences. Our consciousness, or deepest intentions in life, grounds every aspect of our lives. If we live from the intention to give and receive compassionately as we hold with care and attempt to help meet everyone’s needs, the beliefs we hold, the language we use, the way we communicate, and how we use our power to influence those around us will serve life. From an intention of connecting with compassion to all life we embrace core beliefs that align with valuing the precious humanness of each individual even as we strive to change actions that do not honor that humanness. We choose a language that connects rather than separates with words of blame and judgment. We practice communication skills that support deep listening and speaking and compassionate honesty. We use our power with others to transform our relationships, communities, workplaces, and governments into connections and groups that enrich our lives.